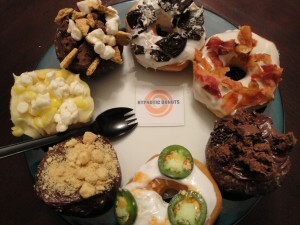 ‘Hypnotic Donuts’ Houses the Best and Most Insane Donuts!!! I don’t always write about restaurants or bakeries, but with this place, ‘Hypnotic Donuts’, something had to be said. ‘Hypnotic Donuts’ got their own location on Garland Rd. in Dallas, TX. Right by White Rock Lake. Their grand opening is this Sunday morning at 9:00 am and it promises to be a bash you won’t forget. I consider myself a sort of donut expert, and these donuts, are not only the best around that I’ve had anywhere in the USA, but they are also the most creative donuts, I have ever ben privy to. With donuts like the ‘Andes Mountains’ (Chocolate Cake Donut with Chocolate Frosting, Crushed Andes Candies, Whipped Cream and topped with an Andes Candy), ‘The Canadian Healthcare’ (Plain Donut with Maple Frosting and Bacon), the ‘Hypnotic’ (Chocolate Cake Donut with Hypnotic Frosting (Chocolate, Caramel & Peanut Butter), Crushed Pretzels, crushed Peanut Butter Cap’n Crunch, Caramel and Chocolate drizzle), ‘The Jenny’s Evil Elvis’ (Plain Donut with Peanut Butter, Bananas, Honey and Bacon), and ‘The Mexico’ (Glazed Donut with White Frosting, fresh Jalapenos and dash of Tabasco), you and your taste buds will go into super over drive and crave more and more. In addition to the donuts, there are biscuits and gravy options. One comes with peanut butter. Sounds most promising. If that wasn’t enough, the place is equipped with tables, chairs, couches, free wifi, and a turntable where you can bring your own vinyl records and listen to your favorite tunes. John Tesh need not apply. Conveniently located between Casa Linda Plaza and the Dallas Arboretum. Next to Barbecs and on Emerald Aisle so you can stop by before or after a nice stroll, run or bike on the White Rock lack trail that is located right out our back door. We will be open for you 7 days a week. Hours are pending but likely 6-12 M-F and 7-2 on Saturday and 8-2 on Sunday. Please follow us on twitter because we will post if we sell out early or decide to open extended hours or nights. Dallas Fan Days Comic Con 2018! This entry was posted on Thursday, January 26th, 2012 at 7:54 pm	and is filed under Events, News. You can follow any responses to this entry through the RSS 2.0 feed. You can skip to the end and leave a response. Pinging is currently not allowed. I’m so glad they’re back. The canadian healthcare and boo-bee are my favorite! Yeah, it’s a good place to be. « Is Ferris Bueller Coming Back for the Super Bowl?? ?